Nov 6, 2016 - General Comments Off on Tales of Lentari #6 is here! Tales of Lentari #6 is here! I just wanted to give everyone a heads-up. My latest fantasy novel, Close Encounters of the Magical Kind, has gone live at Amazon. Since it literally was just released within the hour, it hasn’t had a chance to trickle down through all the Amazon stores. The Amazon UK store doesn’t have it. Yet. I’ll post links as they go active. I’ve also submitted the book to Smashwords. I know it takes some time with them, too, so as each retailer gets the book I’ll add the link below. For all you mystery lovers, the 2nd Corgi Case Files story has been completed and will be released soon. Case of the Fleet-Footed Mummy is now with my primary proofer and will soon be in the hands of my Posse. I’m also participating in the NaNoWriMo group again. That means I’ll do my damnedest to crank out a 50K+ book during this month. I’ve already got one planned and it’ll coincide with the holidays. 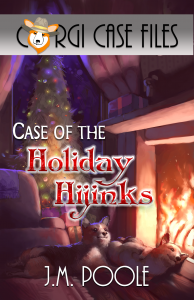 The 3rd mystery novel already has a title: Case of the Holiday Hijinks is already underway! Strange things are afoot in Pomme Valley. Everyone’s favorite corgi duo are on the case! A quick reminder: reviews do help indie authors like myself. Like the books? Please consider telling others about it wherever you purchased the book. That’s it for now. Happy reading! Oct 30, 2016 - General, Indie Authors, News, Private, Updates Enter your password to view comments. As the title implies, I hope to have not one but two releases for you by the end of this month. The next installment in the Tales of Lentari series, Close Encounters of the Magical Kind, is finished and is in the hands of my primary proofer. As soon as she’s done then it’ll be released to the members of the Posse and they’ll go through it with a fine tooth comb. Then it’ll be released. The 2nd title is still being worked on but I have faith that I’ll be able to get it released by the end of the month. Yep, I thought that a book entitled Case of the Fleet-Footed Mummy and Halloween would go hand in hand. So right now I’m busting tail, trying to get that book done, too. I’m trying to schedule some promotions for the first mystery novel and time it with the release of the 2nd, so wish me luck! I’m also heading off for a bit of vacation here in a few days. Will be back by the end of next week. My plan is to get ToL6 out to the Posse before I leave. Fingers crossed, people!! It’s been a busy summer for me. I will say that’s the ultimate way to make time fly: when you realize you don’t have enough and actually want it to slow down. Fans of fantasy should be happy with this. The 6th Tales of Lentari adventure (title has been picked but is HIGHLY subject to change) is almost finished! I’ve got one chapter left and then it’ll be off to the Posse to be picked apart. Mystery lovers will also have something new to read here in about a month. I’m about halfway through the 2nd novel in my new mystery series. 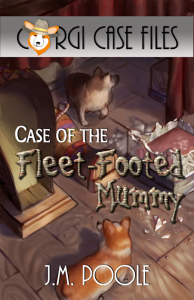 That one already has a title: Case of the Fleet-Footed Mummy (Corgi Case Files #2). The mystery novels are significantly shorter than the fantasy stories I write, so I should be done with this one in a week or two. And then the Posse will go through that one, too. Stay tuned! I’ll keep everyone posted on progress! Also will be working on two covers. Newsletter subscribers will get first peeks at them. I’ll be running ideas by the Posse. In case you were wondering, the Posse are a group of friends/readers who have agreed to lend me a hand to proofread the stories, compare notes, run ideas by each other, and so on. Interested in joining the Posse? Read through the previous blog entry and see what’s expected. If you’re still interested in joining then drop me a line! Also being a movie lover, I’ve watched a number of movies that had a lot of hype to them. I’ll do something new and give you a one line review on each. Finding Dory: hysterical – Disney scores another hit! Have you seen anything good? Want to recommend a new movie? Leave me a comment! Creating “The Posse”. Wanna join? Instead of selecting a number of beta readers, like I normally do, I’m creating a private Facebook group with the sole purpose of gathering some dedicated fans together that are always interested in reading/proofing my books. Are you interested in joining The Posse? Would you like to read the stories long before they’re released to the outside world? Are you willing to leave reviews and share your experience with others? You know what? I’ll post a list of what I’m looking for. Ability to spot typos, grammatical errors, continuity errors, etc. Unafraid to give me critique. Ability to leave reviews on major retailers. Are you interested? Leave a comment here! I’ll be sending out invites to The Posse as soon as its created! Thanks for your willingness to help me out!